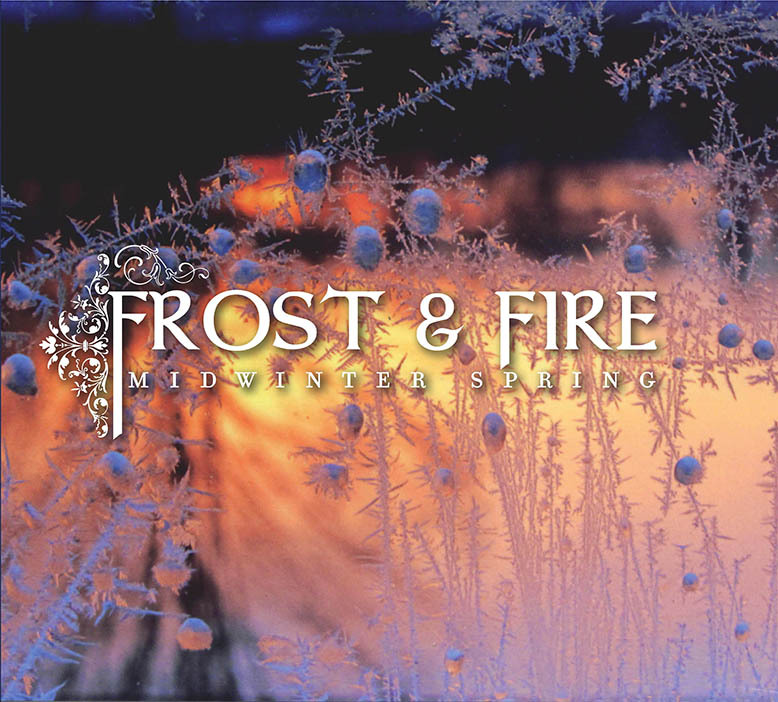 Midwinter Spring is the debut album from Vermont-based band Frost and Fire, featuring a blend of new and traditional Celtic music that will keep you tapping your toes all season long. You’ll hear music for contra dances and waltzes, songs by Robert Burns and Stephen Foster, and a host of tunes by Viveka, Peter, Hollis, and Aaron—many of them never previously recorded. The music ranges from stately and elegant to wild and energetic, always with a variety of texture and instrumentation that helps shape a musical experience you won’t want to miss. Contra dance reels that are favorites of dancers everywhere we play. Three wee reels from Scotland featuring the finest of grooves. A classic from the American tradition by Stephen Foster. Three tunes by Peter: a slinky jig, a driving reel, and then a rollicking reel-ified version of Tendrils. We’ve closed many fine dances with this sweet waltz by Hollis. Aaron wrote Wyoming after a year spent as a field botanist there. It’s our most-requested song. Driving reels by Peter with a rocking pipe tune at the end. Contra dancers love to hoot and stomp their feet to this set of reels. The classic Robert Burns song of wistful farewell. Two tunes by Hollis, one for his kitten’s explorations, the other for a spooky Halloween. Aaron’s funky 10/8 tune honoring friends who lent us their home, Ravencroft, for our earliest rehearsals. Aaron wrote this song of remembrance for loved ones we wish were closer. Sweet and flowing march meets groovy struttin’ tune in a set inspired by English Country Dance. A grand old Scottish fiddle tune meets a fiery new reel by Viveka in this rousing closing set. Hollis improvised the lyric for this Broadway-show-tune-meets-blues-meets-Celtic lament when the recording software, Capture, glitched and lost yet another great take. Unbeknownst to him, Capture was listening to the improv session, and we got to keep it! This track isn’t on the album, but we thought you might enjoy it. Read the full liner notes for more information about the histories of the tunes and songs we chose. Nearly three-quarters of the music on this album was written by Frost and Fire. Midwinter Spring costs $15. Shipping and handling is $4 for the US. Please email us for information about international orders. If you’d like us to autograph your CD(s), please let us know and we’ll get out the silver pens!